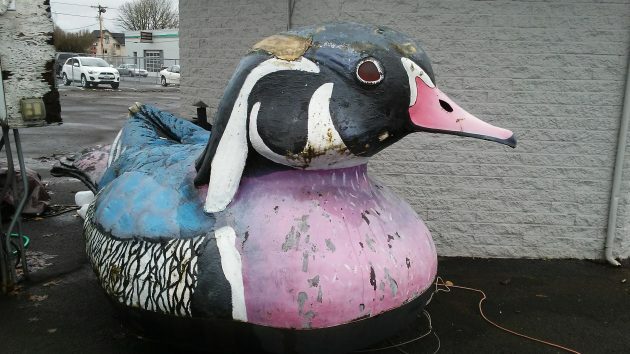 The Waverly Duck has been in open-air storage on a former car lot on First Avenue. In the perhaps-less-than-earthshaking-news department, it looks as though Albany’s Waverly Duck could be back in its pond by May or June. As you know if you kept up with duck developments on this site, the widow of its former owner has given the 13- or 14-foot polyurethane creation to the city of Albany, and as requested by Mayor Sharon Konopa, the city has accepted it with the idea of returning it to Waverly Lake if private funds can be raised. A few days ago I asked the mayor for an update. From Parks and Recreation Director Ed Hodney she had received some preliminary estimates of costs. “It all looks doable,” she said. Once major repairs are done, the duck will probably be moved to the city parks shops for some more detailed painting. And then, Hodney thinks by May or June the duck can once again be anchored in the middle of Waverly Lake, where it floated for years before being taken out in 2007 because it had deteriorated. The city council said it didn’t want city money to be spent on this, so now there will be an effort to raise the necessary funds privately. The mayor said she had asked Councilman Ray Kopczynski to look into starting a Go-Fund-Me campaign. That tired old duck needs to go to Styrofoam heaven. It’s probably brittle and crumbly like foam gets over years. A Beaver would look better any way. All ducks go to heaven. Put this one out of its misery. When I first read the article, I thought oh yuck — that bird really needs to go somewhere besides Waverly Lake. Then I see two others agree with me. I have missed the duck at Waverly pond. I will be glad to see it back where it belongs.